As we have done the last several years, we will again be suspending our Ocracoke Journal for several weeks in order to more fully enjoy the holidays with our family and friends. This will be our last post until January 6, 2014. However, we will still post occasionally on Facebook. Dec. 28, 2 pm - 5 pm: Ocracoke Working Watermen's Association 8th Annual Oyster Roast & Shrimp Steam Fundraiser at the Fish House. Featuring Van O'Neal's Fish Stew. Dessert & hot cider at the Watermen's Exhibit, 3 pm - 5 pm. In the meanwhile, we at Village Craftsmen wish all of our readers a very Merry Christmas...and a Joyous New Year filled with love, justice, and peace. And just for fun, here is a holiday greeting we'd like to share with all of our readers: http://richardwiseman.wordpress.com/2013/12/17/the-amazing-machine/. We will be back here January 6. Be sure to join us in 2014. About twenty-five years ago I spent part of the winter in Quetzaltenango, Guatemala. I lived with a family, and the older daughter asked me to play Santa Claus in a home for disabled children. I was happy to oblige. However, I was dismayed when she brought me the costume. Although I am of average height in the US, I was at least a head taller than most people in Guatemala. The sleeves of the coat were about 5 inches too short, and the pants were half a foot too short. But the worst part was the boots. I pulled with all my might. I pushed the boot down onto the floor. My heel was jammed. Brenda and her boyfriend helped. Together we wrestled my feet into these several-sizes-too-small boots. My toes were scrunched up; my feet were hurting already. When I looked down I realized the boots were on the wrong feet! But there was no way I was going to struggle with them any more. I decided to walk pigeon-toed! Last week Carla, from La Isla Mexican Store in Spencer's Market, asked me to play Santa Claus for a gathering of Ocracoke's Hispanic community. My first question was, "Will your Santa Claus costume fit me?" It did, and I had a great time greeting the children, and handing out small gifts! be all that we need." Comestibles included oyster casserole, venison pate, quiche, meat loaf, ham, green beans with pomegranate, a green salad, deviled eggs, grits & cheese casserole, and homemade bread. Next up was the burning of the bird's nest. This is a ritual that Tom Pahl brought to the island. Four generations of Tom's family have made it a tradition to burn a bird's nest on the Winter Solstice. Tom avers that no one knows how the magic works, but inevitably the sun begins its slow but steady ascent the day following the burning of the bird's nest. Since Lachlan, Amy, and I were all present at the burning of the bird's nest this has now become an Ocracoke tradition spanning three generations of islanders! Everyone present had a jolly good time. We thrive on quirky behavior. Molly Lovejoy kept repeating, "I love this community!" Today at 12:11 EST, for people in the northern hemisphere, the sun will appear to stop in its celestial journey south, pause, then over the next several days, slowly begin to rise again. This makes today the shortest day of the year for those of us living north of the Equator. Because of the tilt of the Earth's axis (the North Pole always points toward the star Polaris) as it obits the sun, we experience four seasons. The Winter & Summer Solstices mark the shortest and longest days of the year; the Spring and Fall Equinoxes mark the times when day and night are of equal length. Humans have long noted the Winter Solstice as a time to celebrate the end of the sun's steady plunge toward the horizon, and the anticipation of the return of more light and longer days. Winter on Ocracoke is a time to step back from the busy-ness of summer, reflect on our lives, and appreciate the beauty of our environment, and the joy of community. We decorate our homes and our village for Christmas, gather together at the Preservation Museum, the Community Center, the School, the Library, and the Churches to celebrate with candles, music, song, family, friends, and good food & drink. You can read an informative article about the Winter Solstice here: http://www.nbcnews.com/science/winter-solstice-sun-stands-still-saturday-2D11770628. In 1988 National Park Service Ranger, Amy Glass, interviewed Ocracoke natives Edgar Howard and Maurice Ballance. Edgar was a vaudeville performer in New York City in the 1920s & 1930s. 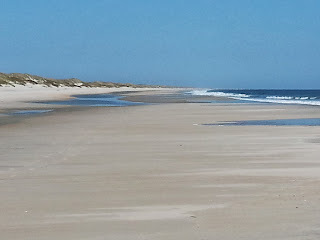 The interview was part of an endeavor called "Lifeways of the Outer Banks" sponsored by the Cape Hatteras National Seashore, National Park Service and The Southern Oral History Program, University of North Carolina at Chapel Hill. The original transcript is on deposit at the southern Historical Collection, Louis Round Wilson Library. Looking for holiday gifts? Village Craftsmen's on-line catalog is filled with quality American made hand crafts. Click on the photo below to visit our page of cast metal table art. In the last few days I have mentioned the old USLSS boathouse which is on Lighthouse Road. Although it has been moved southwest a hundred feet or so from its original location, raised, and remodeled inside, the boathouse looks much like it did many decades ago. This building was where the surfmen from the 1903 station (the station stood near where the current NCCAT Center/Old Coast Guard Station is today) stored their surfboat. In the early twentieth century, the property on which the boathouse stood was on the edge of the "bald beach." From the large wooden doors all the way to the ocean there was nothing but tidal flats. No cedars, live oaks, yaupons, or other vegetation stood in the way of the life savers. With the call, "Ship Ashore!," the surfmen rushed to the boathouse, threw open the doors, hitched their team of horses to the cart holding their surfboat, and proceeded directly across the flats to the beach. Today a veritable forest of trees and vegetation lies between the boathouse and the ocean. Looking for holiday gifts? Village Craftsmen's on-line catalog is filled with quality American made hand crafts. 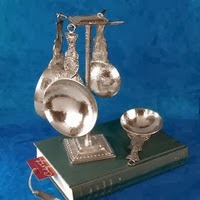 Click on the photo below to visit our page of pewter measuring cups. Two days ago I published a photo of a United States Life Saving Service line marker. The marker in that photo has been moved. It was originally placed on one of the boundaries of the USLSS boathouse property on Lighthouse Road. Actually the boathouse was moved a hundred feet or so to the northeast several decades ago. The boathouse has been raised and remodeled inside, and is now the home of a native islander. A sign by the road identifies the house as "The Boathouse." The line marker below was on one of the other boundary lines. It is in its original location, not far from the road, just southwest of the boathouse. Looking for holiday gifts? Village Craftsmen's on-line catalog is filled with quality American made hand crafts. 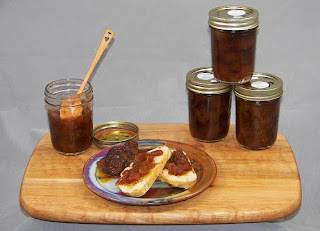 Click on the photo below to visit our page of Ocracoke Fig Preserves. As I've mentioned previously on this blog, we occasionally find seahorses at Ocraocke, sometimes swimming in Pamlico Sound, sometimes washed up on the ocean beach. 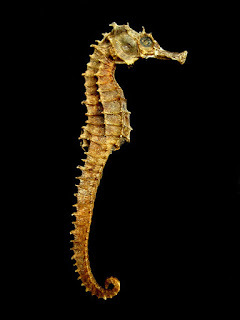 According the the BBC, "The seahorse is one the slowest swimming fish we know of, but it's able to capture prey that swim at incredible speeds." Click on the photo below to read more...and to watch a 30 second video of the seahorse stalking its prey. Looking for holiday gifts? Village Craftsmen's on-line catalog is filled with quality American made hand crafts. Click on the photo below to visit our page of plant rooters. We suggest you place your orders as early as possible. Unfortunately, because of the closing of the Herbert C. Bonner bridge we are unable to offer expedited shipping this season. 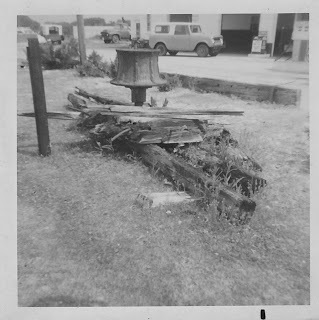 Today we have another historic Ocracoke line marker. This one has the letters USLSS on it. Can you tell us what USLSS stands for? Do you know what parcel of land this object marked? Looking for holiday gifts? Village Craftsmen's on-line catalog is filled with quality American made hand crafts. 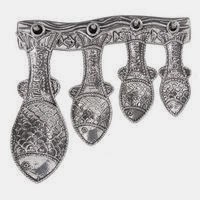 Click on the photo below to visit our page of pewter measuring spoons. RALEIGH - Governor Pat McCrory and Transportation Secretary Tony Tata announce the reopening of the Herbert C. Bonner Bridge on N.C. 12 at 4 p.m. this afternoon. North Carolina Department of Transportation engineers deemed the bridge safe for traffic after several sonar scans, driving two test pilings, and multiple inspections over the past week. The emergency repair work to add more support to the bridge continues. Departing from Cedar Island: 7 a.m, 10, and 4p.m. Departing from Ocracoke: 7:30 a.m, 1p.m., and 4. Departing from Swan Quarter: 10 a.m. and 4 p.m. Departing from Ocracoke: 7 a.m. and 12:30 p.m. 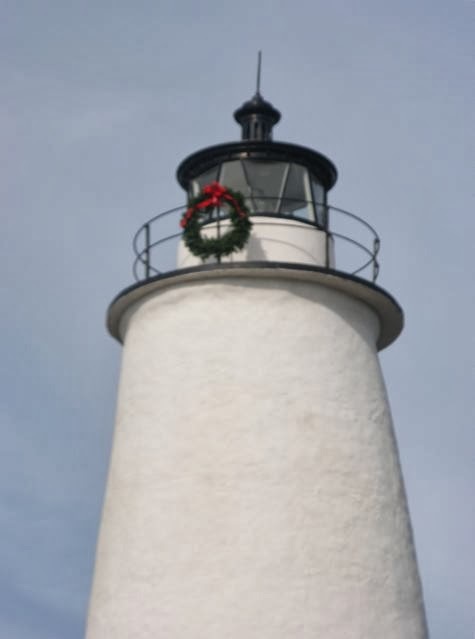 The Ocracoke lighthouse was built in 1823 for $11,359.35. I wonder how many visitors to Ocracoke have seen this line post, near the wooden boardwalk...and I'm curious if anyone knows what the letters USLHE stand for (I will publish the answer in a day or so). Looking for holiday gifts? Village Craftsmen's on-line catalog is filled with quality American made hand crafts. 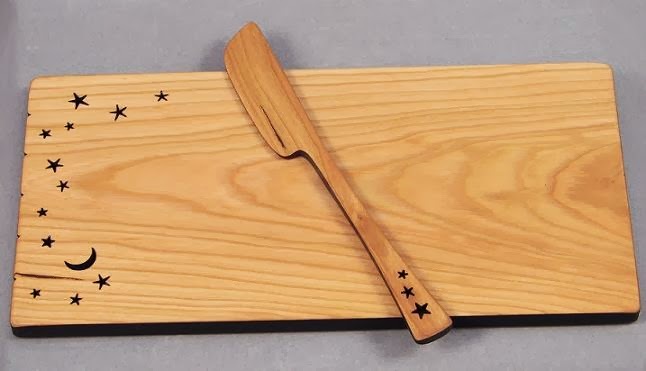 Click on the photo below to visit our page of wooden kitchen items by Moonspoons. 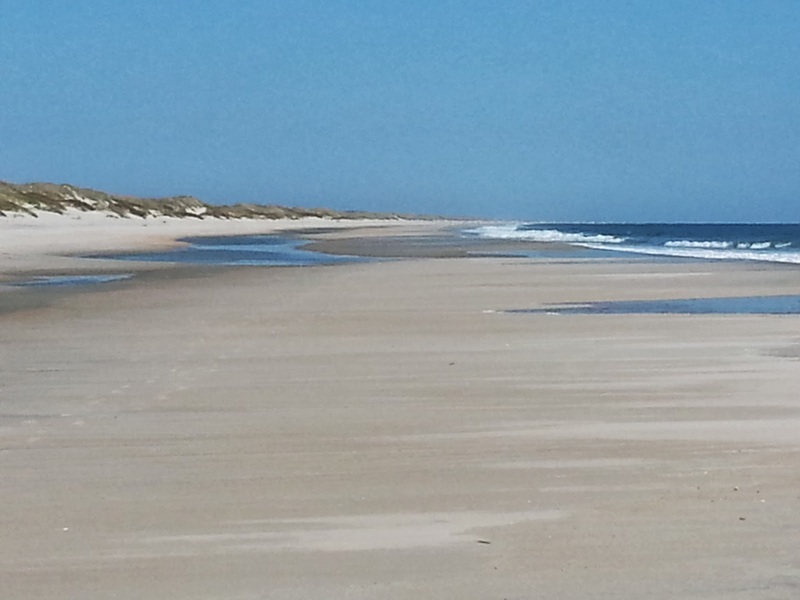 That is 152 acres of land on Ocracoke Island that was owned by one individual! One hundred and five years later, Horatio's heirs might consider themselves lucky to own a half acre of land. December is right in the middle of the prime oyster season. Every once in a while a group of friends gets a bushel of fresh oysters from Pamlico Sound. Then, it's just a matter of steaming the oysters in a large pot, spreading the kitchen table with newspapers, and setting out Saltine crackers, cocktail sauce, butter, and beer. No need to even sit down. Just stand around, pry open the oysters, share stories & jokes...and enjoy this delicious bounty from Pamlico Sound! Looking for holiday gifts? Village Craftsmen's on-line catalog is filled with quality American made hand crafts. 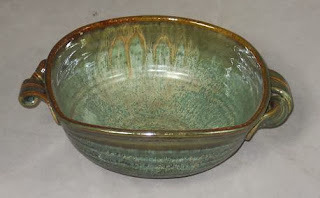 Click on the photo below to visit our page of more Wolf's Den Pottery. Some time ago I heard someone speaking of a ship floundering off shore. A neighbor assured us that the ship might be foundering...but it certainly wasn't floundering. By "floundering" Ocracokers generally mean going out into the shallow waters of Pamlico Sound (either in a skiff, or wading) carrying a spear (with one or more prongs) and a light, looking to gig flounder fish in their beds on the sandy bottom. To flounder also means to thrash about or to struggle. So a ship (especially if it were disabled in a storm) might actually be floundering off shore. If the situation deteriorated, the ship might also founder (sink). I encounter these two words (flounder & founder) occasionally in my reading, and I always have to stop and remind myself of the difference. To flounder is to thrash or struggle; to founder is to sink. A ship can do either! Looking for holiday gifts? Village Craftsmen's on-line catalog is filled with quality American made hand crafts. Click on the photo below to visit our page of Stewart's Stoneware. Today, just a couple of seasonal photos. Looking for holiday gifts? Village Craftsmen's on-line catalog is filled with quality American made hand crafts. Click on the photo below to visit our page of unique and distinctive wooden kitchen items. 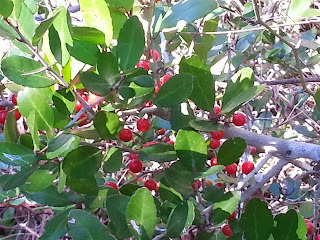 Yaupon holly (Ilex vomitoria) grows wild on Ocracoke Island. Many of our readers know that islanders have traditionally used the dried leaves to make tea. 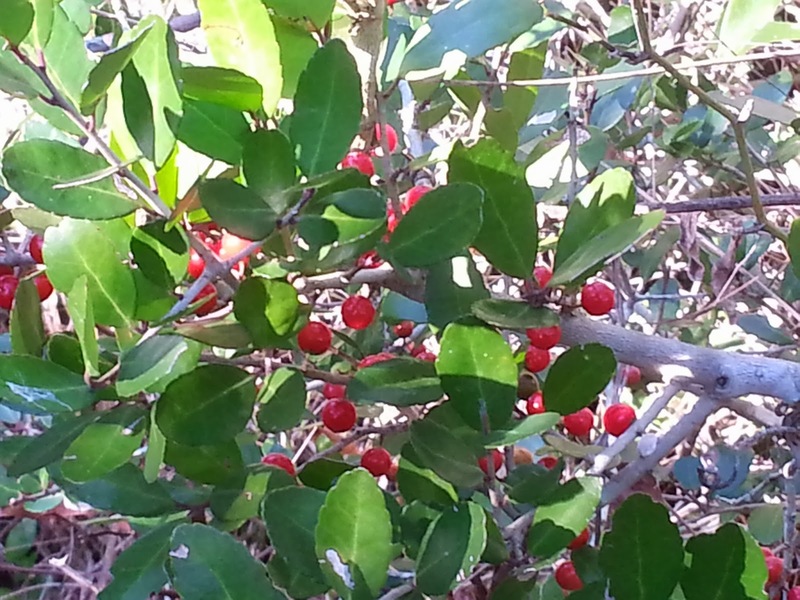 From September through December female yaupon bushes (yes, there are male and female individuals) produce berries that turn red in time for the Christmas season. Because of their combination of bright green leaves and scarlet berries many islanders use yaupon branches to decorate tables, mantels, and yule logs during the holidays. This photo of the Community Store was taken in December, 2010. Islanders and visitors were disappointed when the store closed shortly thereafter. This season we have reason to celebrate. On November 10 "the Ocracoke Foundation announced the acquisition of the Community Square, a 0.5-acre waterfront property in the heart of the Ocracoke Island historic district. The Foundation was able to purchase the property with generous financial support from Foundation partners and The Conservation Fund’s Land Conservation Loan Program. Thank you to everyone who worked alongside us during the past four years. All of the hard work has preserved an island treasure and we look forward to announcing exciting new plans in 2014. Help us continue to carry out other meaningful projects by becoming a Foundation supporter. Our community projects and goals cannot be met without your support. Please consider making an end of year donation. by phone(252)921-0365 or by mail. Looking for holiday gifts? Village Craftsmen's on-line catalog is filled with quality American made hand crafts. 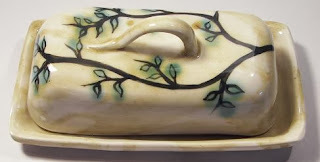 Click on the photo below to visit our page of beautiful utilitarian pieces by Blanket Creek Pottery. Today is Cousin Blanche's birthday. She is 94 years old, and doing great. Yesterday afternoon she helped me host for the Ocracoke Historic Homes Christmas Tour. She was a striking figure in her red Christmas finery! Leave a birthday wish, and I will print them out and carry them to her later this afternoon. This photo, taken near the "Lifeguard Beach" midday in late October, is revealing. As you can see, there are no beach umbrellas, no blankets or chairs, no Frisbees being thrown, and no people for miles. Of course, it can be cold and blustery, and few venture into the water after October, but the tranquility and quiet are soothing and therapeutic. David Tweedie is such a wonderful son-in-law! He called me yesterday afternoon. "I want you to come to dinner tonight," he said. "Lachlan and I have a surprise for you. It's a surprise for Amy also. Both of you just be near your cell phone at 5:15, and be sure to wear something warm. We'll give you instructions." Amy and I were intrigued. What was David up to, we wondered. We got the call at 5:20. "Come on out to the Lifeguard beach." 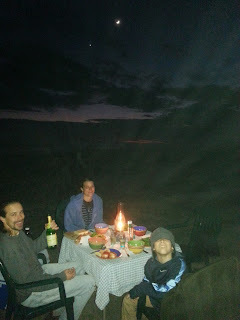 There they were, on the edge of the outgoing tide, a waxing moon shining through the clouds, a coal oil lantern on their festive table, beckoning us to take our seats. After we toasted our family with red wine and sparkling grape juice, David ladled his steaming homemade soup into our bowls. 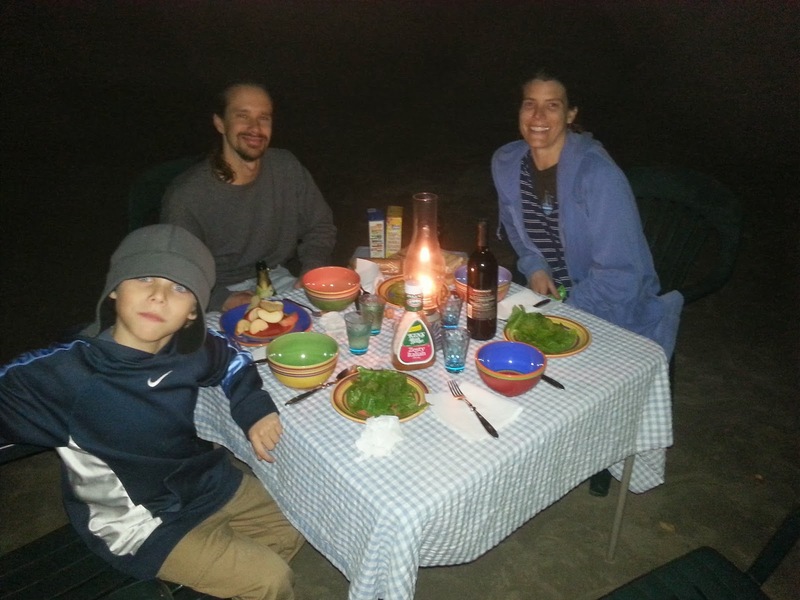 A green salad from his garden, slices of apple, cheese, and crackers rounded out the meal. David and Lachlan even brought homemade fig cake for dessert. Can you imagine? It was December 5, the temperature was in the upper 60s, and it was a spectacularly beautiful evening. Not a single other soul ventured out on the beach. Our personal dining room extended up and down the beach as far as you could see, and for several miles across the Atlantic Ocean. It was an evening to remember and cherish. Thank you, David. Looking for holiday gifts? 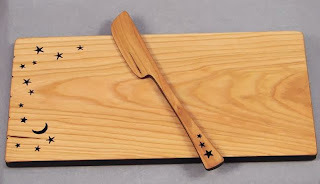 Village Craftsmen's on-line catalog is filled with quality American made hand crafts. Click on the photo below to visit our page of Jarret Werley's Ocracoke photos on stretched canvas. In August, 1921 the five-masted schooner, Carroll A Deering, wrecked under mysterious circumstances on Diamond Shoals off the coast of Cape Hatteras. The sails were set and food was in the galley stove, but only a cat prowled below decks. No other living soul was aboard. The Deering soon became known as the "Ghost Ship of the Outer Banks." The schooner broke apart, and much of the wreckage washed ashore on Ocracoke, where it remained visible for more than 30 years. The Deering's windlass provided an iconic image for many a professional and amateur photographer. In 1955 a storm carried the remains of this once grand ship to Hatteras. For years it rested in front of Wheeler Ballance's Texaco station in Hatteras village, where it was when my mother made this snapshot. Today, the remains of the Deering are on display in the Graveyard of the Atlantic Museum in Hatteras. Stop by the museum for more information about this vessel and the mystery that still lingers concerning the captain and crew. Looking for holiday gifts? 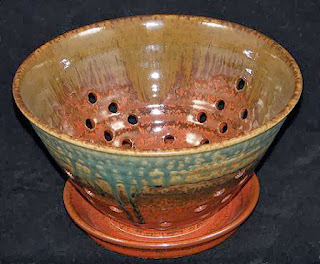 Village Craftsmen's on-line catalog is filled with quality American hand crafts. 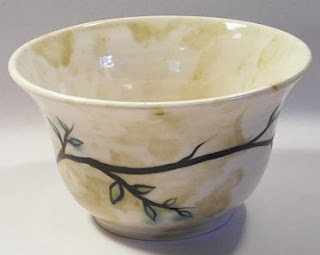 Click on the photo below to visit our page of Amanda Wolf's durable and functional pottery inspired by nature. MANNS HARBOR - The North Carolina Department of Transportation's Ferry Division's emergency route between Stumpy Point and Rodanthe went into full operation Wednesday, with steady traffic and short-to-moderate wait times reported at both terminals. Departing Ocracoke: 7 a.m, 10 a.m, 12:30 p.m. Departing Swan Quarter: 10a.m., 1 p.m., 4 p.m.
Also, fuel trucks will have designated runs on Tuesdays and Fridays from Stumpy Point at 5 a.m. and from Rodanthe at 4:30 p.m. This will allow more deck space for regular vehicles on the other runs. 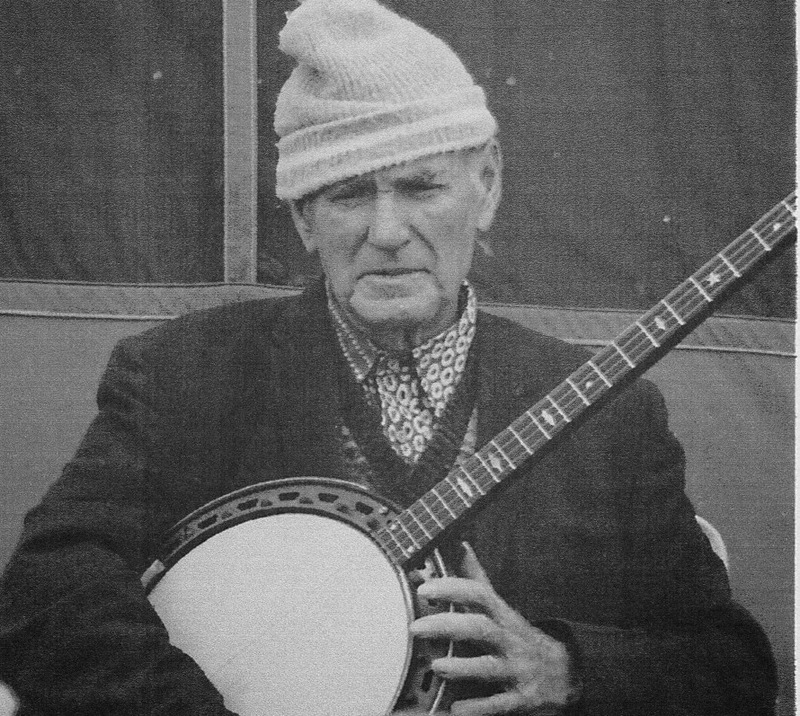 Molasses Creek's Fiddler Dave told me how to make a small fortune as a folk musician. "Start with a large fortune," he explained, with a smile. 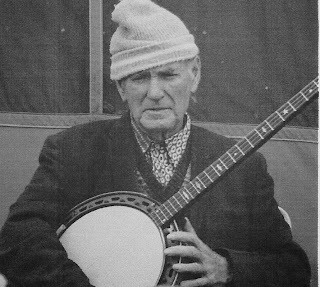 As most of our readers know, music is a long established, and important tradition on Ocracoke Island. Every year the cost for producing CDs looms larger, as does the cost of promotion. Molasses Creek, Ocracoke's long established roots/folk band, is planning another international radio push and winter tour to coincide with the release of their 13th recording ("Something Worth Having"). They hope to beat their 2012 record of #4 on the national folk charts for "An Island Out of Time"! 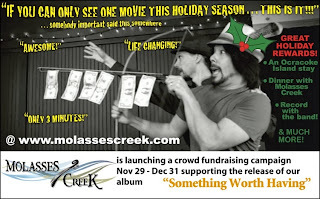 To help reach their current goal, Molasses Creek has initiated a crowd fundraising campaign that includes a promotional website with a quirky (what else would you expect?) 3 minute video, information about the history of the band, their current projects, and associated costs. There is a wide range of pledge opportunities, with appropriate prizes associated with each one. Click on the image below, or the following link for complete information. My grandson, Lachlan, is sometimes described by islanders as "cunning." You may be thinking, does that mean he is wily, tricky, and sly? Well, he may be that...but not in a mean or nasty sense. At any rate, that is not what my neighbors mean by "cunning." Cunning, on Ocracoke is often used in its early sense to mean clever, cute, appealing, and even "displaying keen insight." So, if you hear an Ocracoker calling someone cunning, be assured it is a compliment. Sometimes visitors to Ocracoke wonder how residents got from place to place before WWII, when the first paved roads came to the island. The lanes and footpaths were often deep, soft sand. Usually islanders simply walked, although a few automobiles were brought to the village in the 1920s. As you might imagine, the cars frequently got bogged down. This photo below is of my Uncle Evans in a two-wheeled pony cart. This is the only type of horse drawn vehicle I've ever known to be used on Ocracoke. 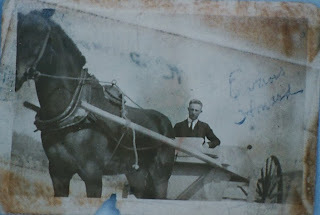 Pony carts were employed when freight was unloaded from incoming vessels, and whenever other heavy loads needed to be carried from one area of the village to another. Sometimes, as it appears in this photo, pony carts were used for recreation. It looks like Evans might be on his way to meet a young lady. This coming Friday, December 6, at 7:30 PM there will be a concert of Christmas choral music at the Ocracoke United Methodist Church featuring musical styles from the 12th century to the present. Public Radio East’s classical music host, Finley Woolston, will direct his Joyful Band of Singers in this free holiday event. Everyone is welcome! Finley Woolston's voice is very familiar across Eastern North Carolina to listeners of WTEB 89.3 FM, Public Radio East's Classical Music station. For over 20 years Finley has hosted a variety of classical programs and currently is the host for PRE's Classical Morning Concert. Finley is also the producer and host of The Choral Tradition, a program dedicated exclusively to choral music, heard each Sunday at 3:00 p.m. on PRE. Finley has performed with many Eastern North Carolina choruses and is the Music Director of Richlands United Methodist Church, in Richlands, NC and is also the Music Director and Conductor of the Crystal Coast Choral Society. Many thanks goes out to the Ocracoke United Methodist Church for hosting the concert, and to Ocracoke Alive for assisting with housing and food for the performers.